While many jungle lodges can arrange to pick you up at the airport, you might find yourself spending a day or two in Iquitos. Either because your flight arrives too late or leaves too early or because you still need to arrange a jungle tour (which most hostels can help you with). 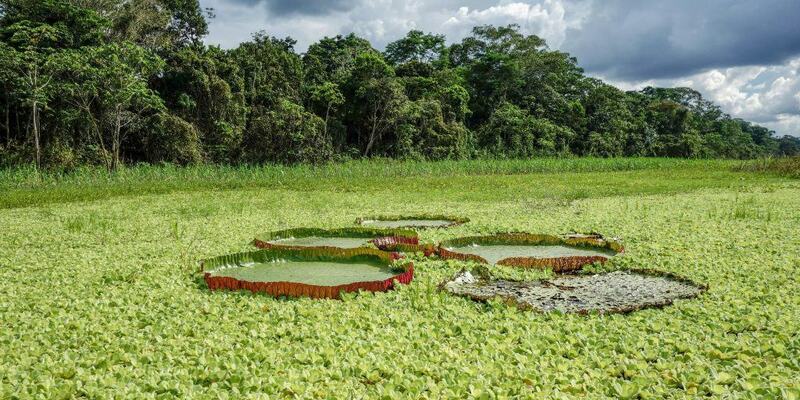 Whatever the reason that leaves you staying in Iquitos itself, there are a couple of things to do here. We visited the Manatee Rescue Centre on our way to the airport while coming back from our jungle stay. I absolutely loved it. 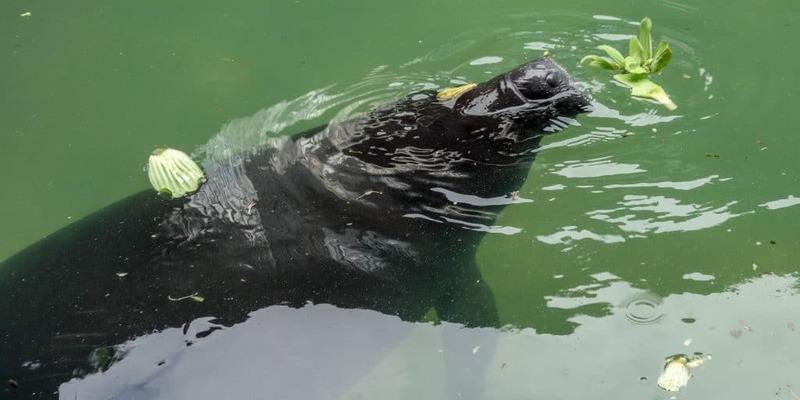 The Rescue Centre does not just rescue manatees but takes care of all animals that it receives. Many have been in someone’s home as pets, or have been caught by smugglers who wanted to sell them for a high profit. Most have been mistreated, so the Rescue Centre takes care of them, treats them and then, if possibly, tries to release them into the wild. It also conducts educational programs, teaching children the importance of environmental conservation. When visiting, ask for English tours. We were lucky and got our own tour guide who explained us about the animals and everything the Rescue Centre does. He also showed us the manatees that the Centre was named after and we even got to see how they were fed, weighed and taken care of by veterinatians! I highly recommend coming here. The Rescue Centre reminded me of how fragile this ecosystem is and how important it is to protect it. 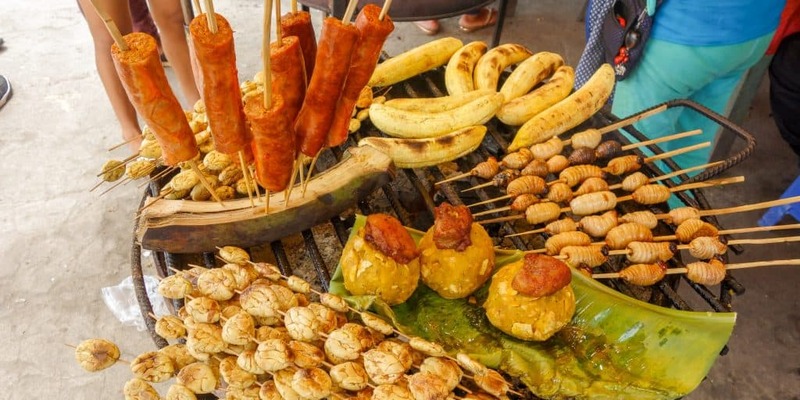 In Iquitos, you can find lots of food that you will not see anywhere else in Peru. From exotic fruit to Juane or maggots on a stick, there is lots to discover. We had a great lunch here, tasting lots of flavours I had never had before (though, to be honest, I could have lived without the maggots). You can get the best streetfood up at the market in Bellavista, but if you don’t want to make your way up here, you will also find streetfood vendors all over town. Located in the Northern part of the town, the market in Bellavista is not just worth visiting for its food (although the food and the fruit are amazing). It is also an interesting place for watching people going about their daily life in the Amazon. We were approached by several people offering us boat trips, so if you want to go for a ride on the Amazon, this is a good starting point. Someone also offered a tour to a butterfly garden to us, though we didn’t go there and therefore I do not know more about it. While walking over the market, look out for the different species of fish, all coming straight from the Amazon. You can find some very strange looking ones here. 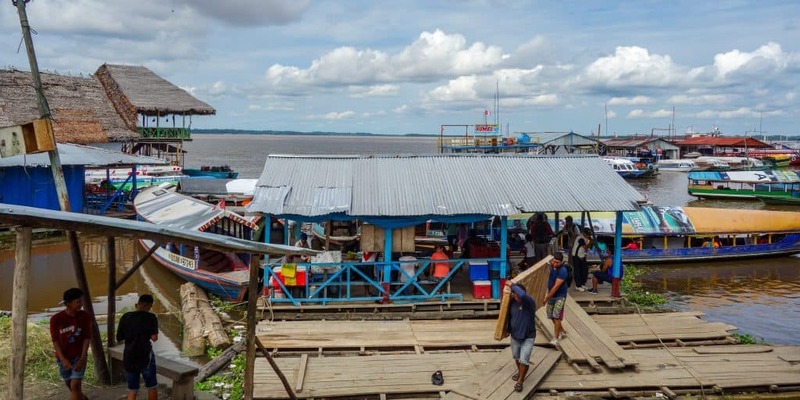 Eventually, you end up by the water where you can watch people load cargo on their boats and set off for a ride up and down the Amazon. 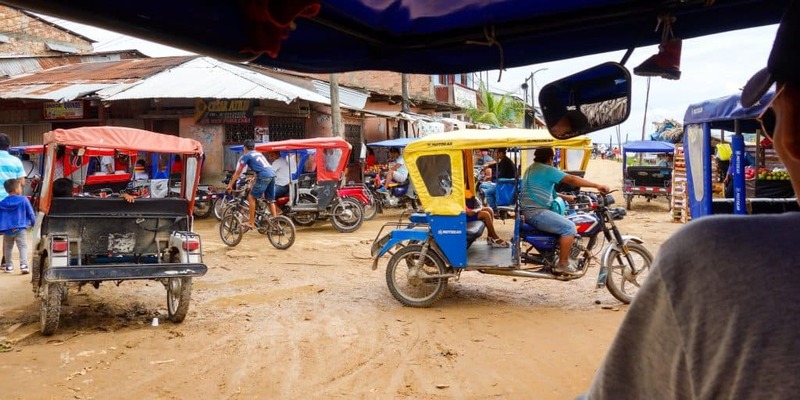 Iquitos is very different from other cities in Peru. Here, you can find dirt roads in the middle of the city. The houses are painted in various colours and motortaxis zip around the streets. We mostly drove around the city but I wish I’d had the time to get off at the main square and go for a walk. Or to sit on a bench and watch the people go about their daily lives. When you’re done exploring and need a break, find a small cafe or restaurant and ask for a jugo de tomate. This is a tree tomato juice and has nothing in common with regular tomatoes. It is instead deliciously sweet and fruity. I highly recommend it. I heard that Belen is very nice to visit, too, and that it is Iquitos’ most interesting neighbourhood. If you go there, let me know how you liked it and if it’s something you would recommend. 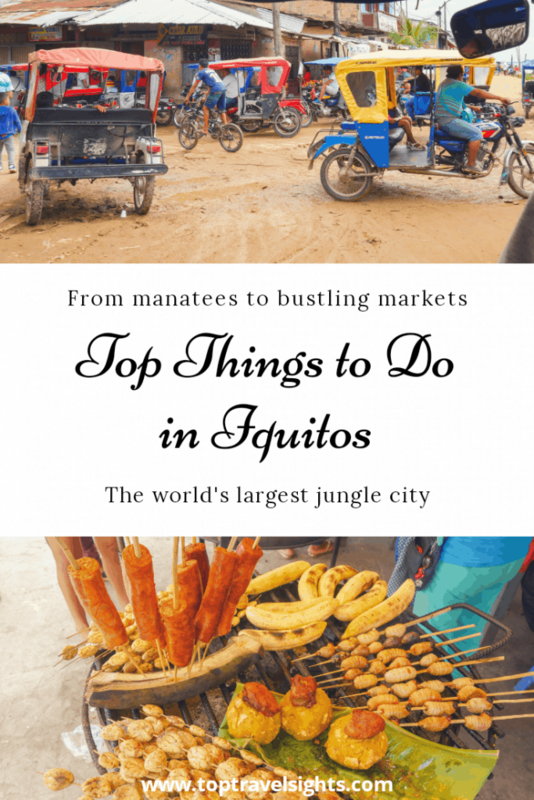 The main reason to visit Iquitos is, of course, to go on a jungle tour. Cruising along the Amazon, watching sloths and pink dolphins is one of the best things I’ve experienced in Peru. You can find lodges all along the rivers. When booking one, ask about what’s included, whether your guide speaks English or only Spanish and whether or not the lodge acts responsibly towards the wildlife. Picking up animals to take pictures with them is harmful and will cause long-term damage to this fragile ecosystem. We went to the Libertad Jungle Lodge, a place that I can highly recommend. Our guide, Osmar, was amazing. We saw many animals and he shared a lot of information about the jungle. Plus, everything was included, from meals to activities to pick-up and drop-off in Iquitos. If you want more information, read up on 5 reasons to visit the Amazon or read my personal tale of how I experienced the jungle. And if you have ever been to Iquitos, I would love to hear from you. Did you like it? What did you do?